The Bridge Guide on Card Combinations is practical because although card combinations can be seen in isolation, a useful way to gain an understanding is to see them in the context of carefully prepared, instructional deals. This is a dynamic Bridge Guide that will improve your declarer play. You'll see how to effectively use Declarer's Plan; how to combine chances on Declarer's Checklist to increase the odds; to look for card combinations that provide more than a 50% chance; to know when to lead a high card instead of leading toward a high card; and when to watch out for the opponents. About The "Bridge Guide Series"
The Bidding, Declarer Play and Defense Bridge Guide Series present Five Tips to Simplify one aspect of the game. Part One of the Guides is divided into five segments each presenting a snapshot, in turn, of each of the five tips. 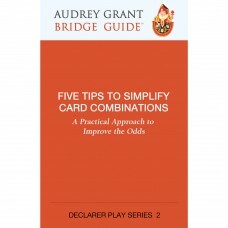 Part Two presents a selection of sixteen instructional deals, designed carefully to illustrate the material in a practical way, so you can comfortably apply the ideas the next time you play bridge. The Guides are multi-level and suitable for players with a wide range of experience and skill. The deals progress until you reach Deals 15 and 16, famous deals that show how experts use the information in the Bridge Guides. We invite you to visit the Resources section of www.betterbridge.com to download the sixteen instructional Deal Records. Along with your Bridge Guides you'll have the material for a Bridge Book Club!